Managing agents throughout the day is a critical component of ensuring operational efficiency in your contact center. You need a tool to track Real-Time Adherence. After all, as you invest human resources, as well as technology, it's important that you are getting the most out of these investments. If your agents are not adhering to the optimal schedules delivered by the workforce management (WFM) system, this will contribute to lost time and higher costs, which hurt your bottom line. Real-Time Adherence is a key ingredient in managing your workforce and delivering industry standard KPIs, while improving your overall productivity. Front Office – Contact center management can measure and monitor agents in real-time by comparing their scheduled information to the actual phone states. Effectively doing so will ensure service objectives are met and organizational KPI measurements are delivered for actionable results by the agent and supervisors. Back Office – Desktop agent adherence has become a critical need in managing your back office personnel. Management now has the ability to look at agents’ active windows to compare their scheduled work in a real-time adherence view. Additional reporting can be viewed to display how much time an agent spent in a particular screen (i.e. Facebook, Amazon, work items) to give visibility where the agent is spending their time. Global – In the multi-site world, management needs to be able to quickly drill down to any center at a given time. Through Pipkins RTA Global functionality, views can be configured any way needed by looking at a roll up of adherence metrics. Drill down capabilities can then be set up by individual site in order to find the root cause of adherence issues. Notifications and alerts are set up to quickly communicate this out, thus providing quick and actionable adherence changes to meet organizational objectives that have been set. Virtual – As the phenomenon of home shoring continues to grow, Pipkins @HomeVantage provides the capability to monitor real-time adherence through its Global Supervisor views. Supervisors have a unique challenge in the at home world as they are typically at a higher agent to supervisor ratio. Real-Time Adherence provides the ability to quickly see agents that are not adhering to their schedule. Since the agents are virtual, Desktop Adherence becomes increasingly important as this provides another way for the supervisor to "see" what the agent is doing real time. 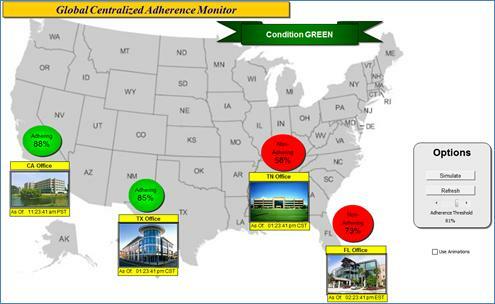 Pipkins Real-Time Adherence capabilities are unique in the industry in delivering operational visibility to organizations. The ability to be flexible for every environment is a critical need to meet workforce management objectives, delivering KPIs and productivity which ultimately reduces your top line staffing costs.